CLEVELAND, USA -- As multiple global crises compete for our attention, we must not neglect the situation in Ukraine. Rob Portman is a U.S. 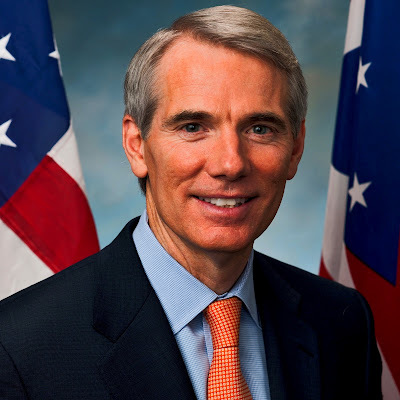 Senator from Ohio. I recently returned from trip to Ukraine, a year after Senator Cardin and I led a Congressional delegation to monitor last year's presidential election. Much has happened since then. Ukrainians have made incredible sacrifices in the hopes of securing a democratic future but they need sustained economic, political, and military support from the United States and NATO to ensure a successful future. They have also made an unequivocal choice to pursue a pro-Western, democratic path, and are making progress in fighting decades of corruption that left Ukraine weak, while dealing with a blatant Russian invasion. Successful follow-through on these reforms will be essential to the long-term success and prosperity of Ukraine. However, these efforts won't mean much if Ukraine is unable to secure its borders or defend itself. The current cease-fire is not credible, and the Obama administration and some of our European allies need to stop pretending that it is. Thousands of Russian troops remain inside Ukraine and thousands more are right across the border. Every day, Ukrainian positions come under attack. Many of these attacks involve the use of heavy artillery systems that were supposed to have been withdrawn under the terms of the cease-fire. The Organization for Security and Cooperation in Europe's monitors are routinely denied access to separatist-controlled areas, which makes verification very difficult. The United States and NATO must do more to strengthen Ukrainian military capabilities. In the short-term, Ukraine needs anti-tank weapons, secure communications, night vision and thermal optics, UAVs, and air defense systems. Equally important is effective monitoring of U.S. assistance to ensure it reaches the front-line troops. We must also provide assistance in crucial areas such as defense institution-building, training, and reform of the Ukrainian defense-industrial base. This will enhance the long-term effectiveness of the Ukrainian military. Congress has voted repeatedly to increase military assistance to Ukraine, most notably through the Ukraine Freedom Support Act, which was signed by President Obama. However, the president hasn't used the authorities granted to him by this legislation. The debate in Congress is over. We are simply waiting for President Obama to demonstrate leadership. The Administration believes the requested U.S. support for Ukraine will lead to more instability. I believe that further inaction will only expand the current conflict. At no point have President Putin's decisions been costly enough to force him to reconsider his strategy. Russia's annexation of Crimea, and recent winter offensive all happened despite Western attempts to force a negotiated settlement. Each temporary cease-fire has merely legitimized Putin's actions by essentially accepting Russia's gains on the ground. Russian aggression in Ukraine won't go away or resolve itself simply because we wish it to be so. It's time for the president to start shaping outcomes, and stop getting shaped by them. Our efforts must be part of a broader strategy to support regional allies and deter Russian aggression. We must demonstrate America's commitment to the security of our friends through a reinforced NATO presence in Eastern Europe and more vigorous engagement in training and security cooperation. President Putin's actions upend decades of established international norms and the response demonstrates the weakness of the Western alliance and America's leadership. Confidence in America and our European allies' commitment to uphold these norms deters bad actors and incentivizes other countries to play by the rules. If our credibility is in doubt, the chance for violence and instability increases. Nearly every Ukrainian official I met with understood this. It's time the White House did as well.